What are Food Stamps? • Cash voucher/coupon that can be exchanged by the coupon holder for specified foods. • E. g. , Consumer holds Rs. 50 worth of food stamps. Buys Rs. 70 worth of food – uses the stock of food stamps plus Rs. 20 of cash. • The exchange facility can be made available at regular commercial outlets – kirana stores. • The shop owner redeems the food stamps at a designated bank or post office. 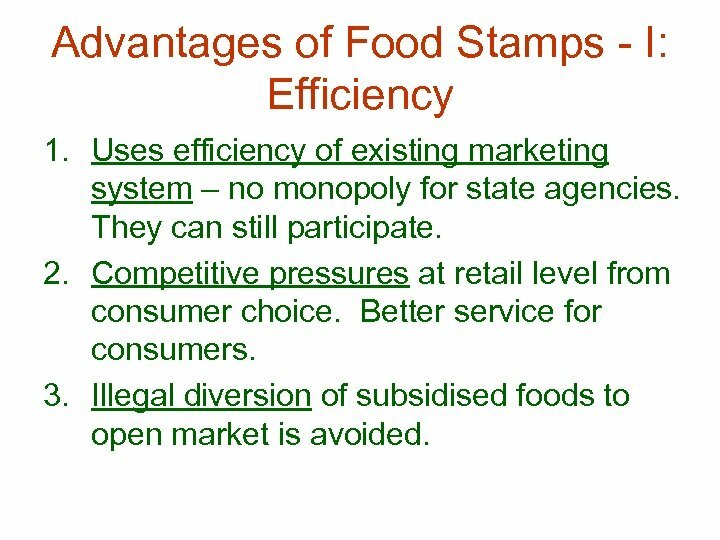 Advantages of Food Stamps - I: Efficiency 1. Uses efficiency of existing marketing system – no monopoly for state agencies. They can still participate. 2. Competitive pressures at retail level from consumer choice. Better service for consumers. 3. Illegal diversion of subsidised foods to open market is avoided. 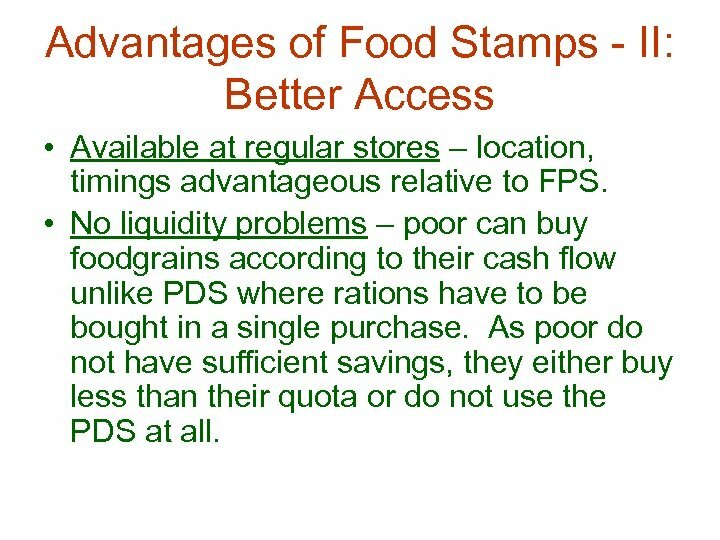 Advantages of Food Stamps - II: Better Access • Available at regular stores – location, timings advantageous relative to FPS. • No liquidity problems – poor can buy foodgrains according to their cash flow unlike PDS where rations have to be bought in a single purchase. 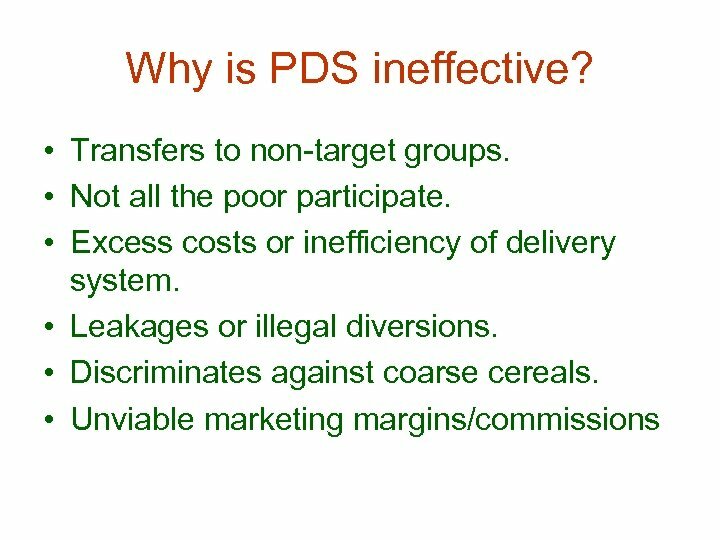 As poor do not have sufficient savings, they either buy less than their quota or do not use the PDS at all. 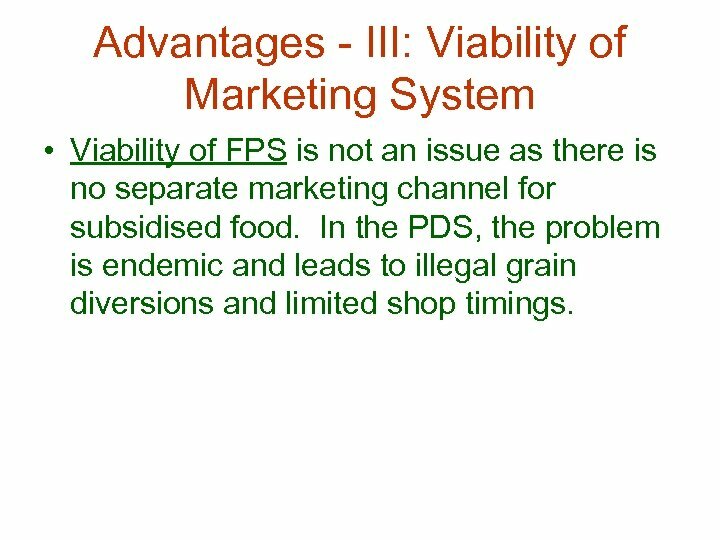 Advantages - III: Viability of Marketing System • Viability of FPS is not an issue as there is no separate marketing channel for subsidised food. In the PDS, the problem is endemic and leads to illegal grain diversions and limited shop timings. 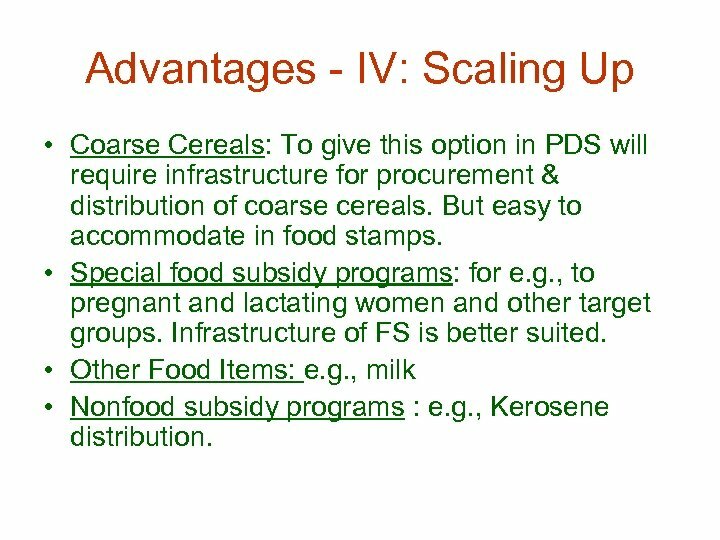 Advantages - IV: Scaling Up • Coarse Cereals: To give this option in PDS will require infrastructure for procurement & distribution of coarse cereals. But easy to accommodate in food stamps. • Special food subsidy programs: for e. g. , to pregnant and lactating women and other target groups. Infrastructure of FS is better suited. 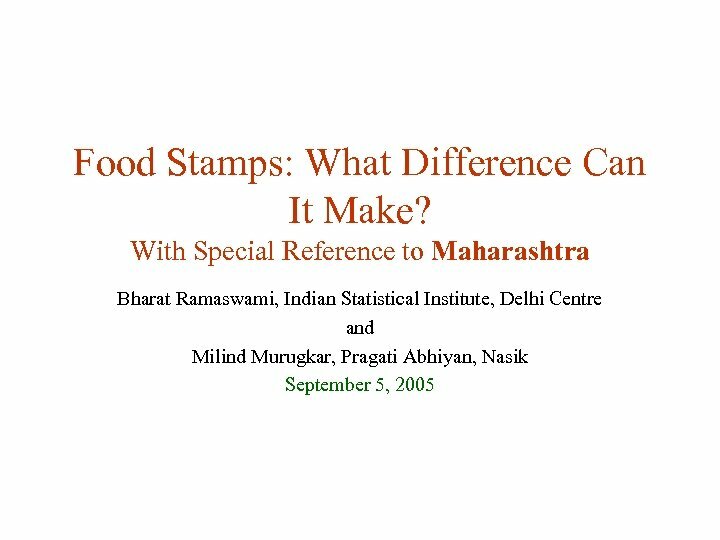 • Other Food Items: e. g. , milk • Nonfood subsidy programs : e. g. , Kerosene distribution. 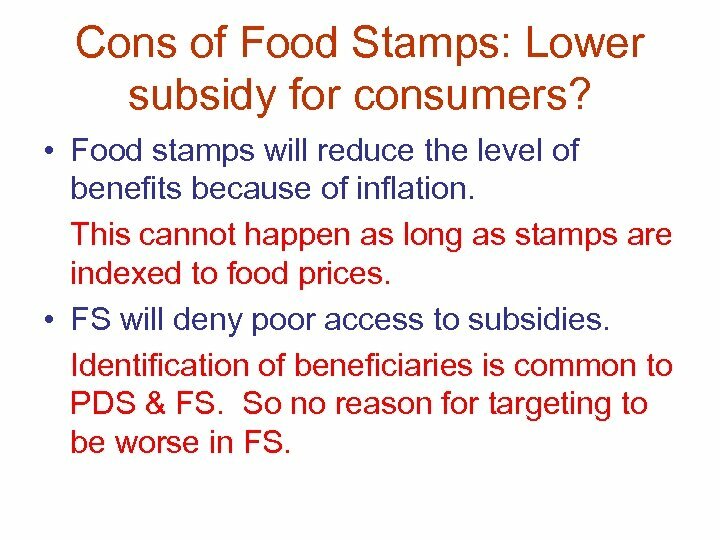 Cons of Food Stamps: Lower subsidy for consumers? • Food stamps will reduce the level of benefits because of inflation. This cannot happen as long as stamps are indexed to food prices. • FS will deny poor access to subsidies. Identification of beneficiaries is common to PDS & FS. So no reason for targeting to be worse in FS. 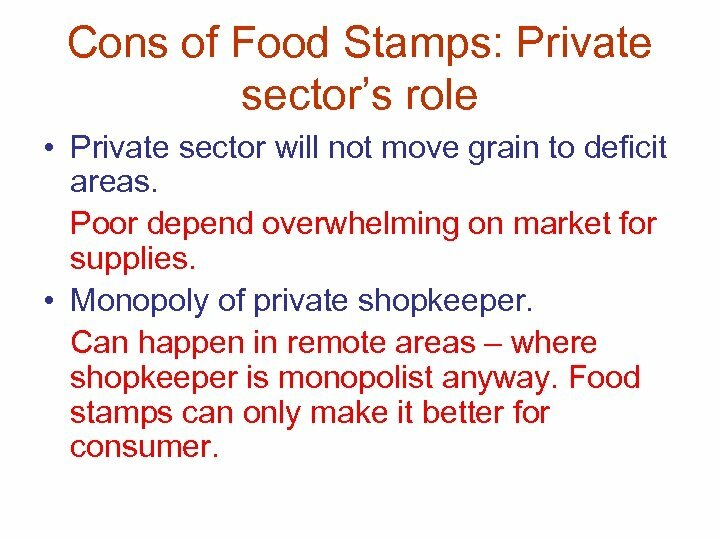 Cons of Food Stamps: Private sector’s role • Private sector will not move grain to deficit areas. Poor depend overwhelming on market for supplies. • Monopoly of private shopkeeper. Can happen in remote areas – where shopkeeper is monopolist anyway. Food stamps can only make it better for consumer. 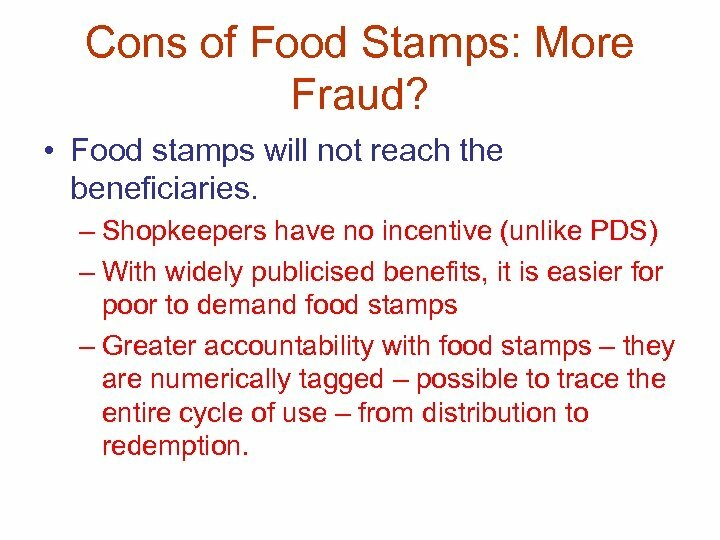 Cons of Food Stamps: More Fraud? • Food stamps will not reach the beneficiaries. 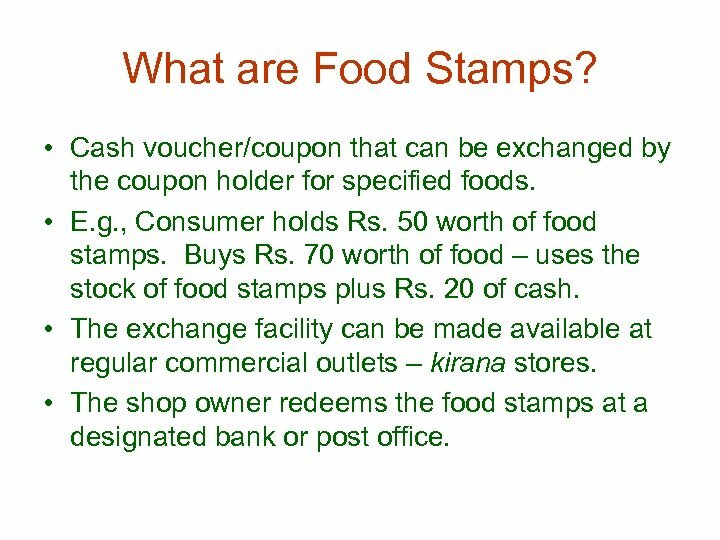 – Shopkeepers have no incentive (unlike PDS) – With widely publicised benefits, it is easier for poor to demand food stamps – Greater accountability with food stamps – they are numerically tagged – possible to trace the entire cycle of use – from distribution to redemption. 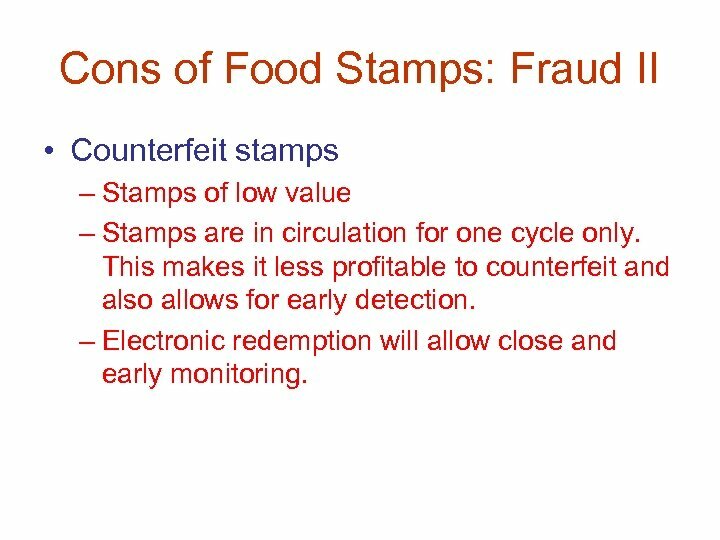 Cons of Food Stamps: Fraud II • Counterfeit stamps – Stamps of low value – Stamps are in circulation for one cycle only. This makes it less profitable to counterfeit and also allows for early detection. – Electronic redemption will allow close and early monitoring. 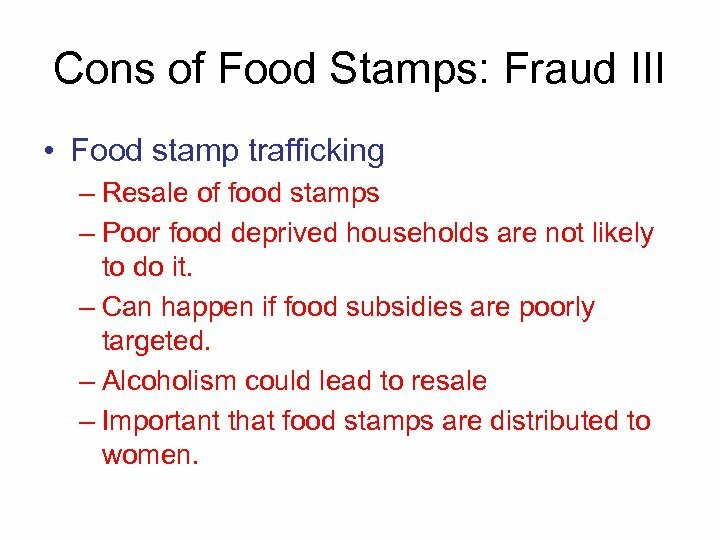 Cons of Food Stamps: Fraud III • Food stamp trafficking – Resale of food stamps – Poor food deprived households are not likely to do it. – Can happen if food subsidies are poorly targeted. – Alcoholism could lead to resale – Important that food stamps are distributed to women. 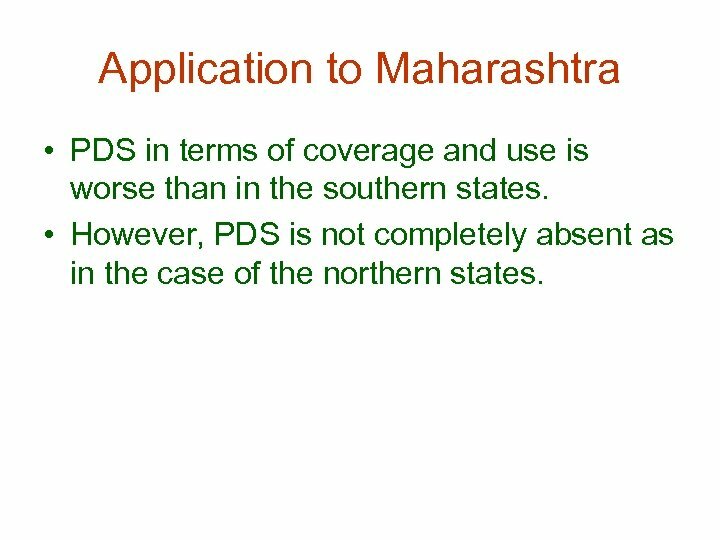 Application to Maharashtra • PDS in terms of coverage and use is worse than in the southern states. • However, PDS is not completely absent as in the case of the northern states. 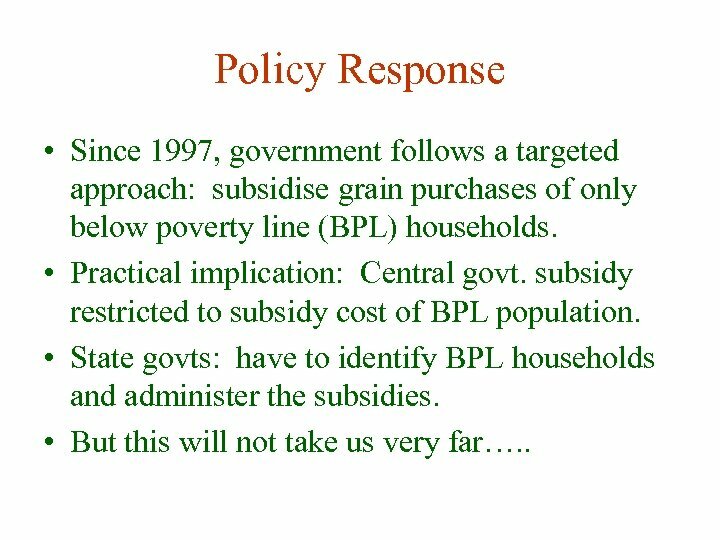 Policy Response • Since 1997, government follows a targeted approach: subsidise grain purchases of only below poverty line (BPL) households. • Practical implication: Central govt. subsidy restricted to subsidy cost of BPL population. • State govts: have to identify BPL households and administer the subsidies. • But this will not take us very far…. . 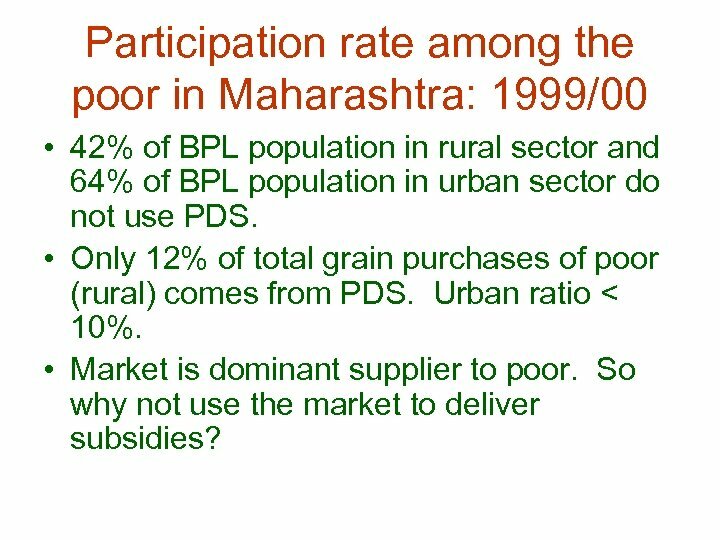 Participation rate among the poor in Maharashtra: 1999/00 • 42% of BPL population in rural sector and 64% of BPL population in urban sector do not use PDS. • Only 12% of total grain purchases of poor (rural) comes from PDS. Urban ratio < 10%. • Market is dominant supplier to poor. 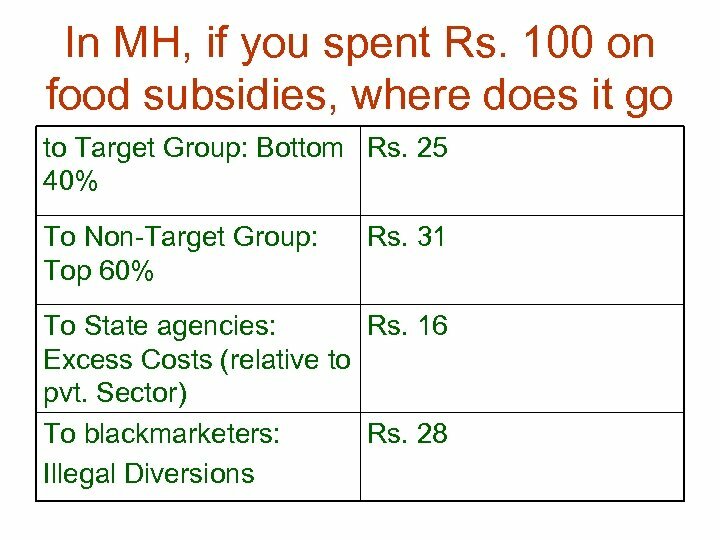 So why not use the market to deliver subsidies? 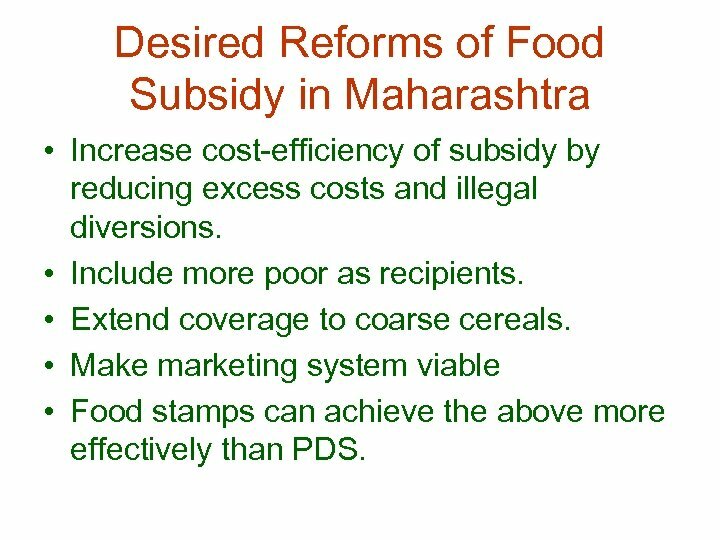 Desired Reforms of Food Subsidy in Maharashtra • Increase cost-efficiency of subsidy by reducing excess costs and illegal diversions. • Include more poor as recipients. 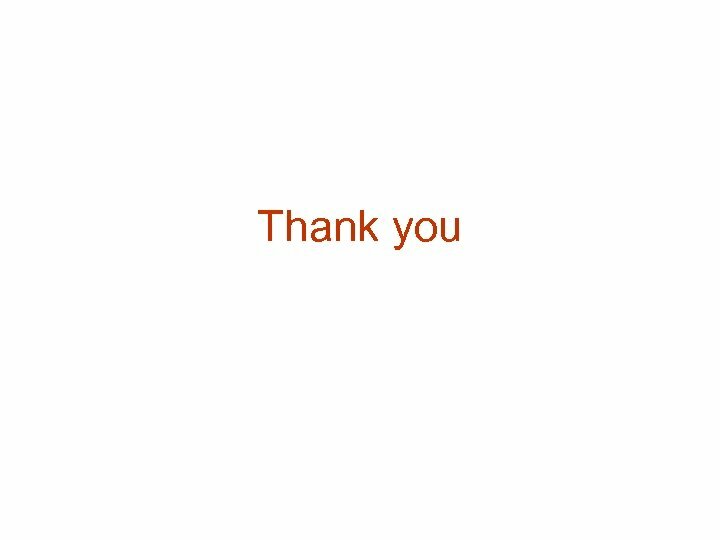 • Extend coverage to coarse cereals. 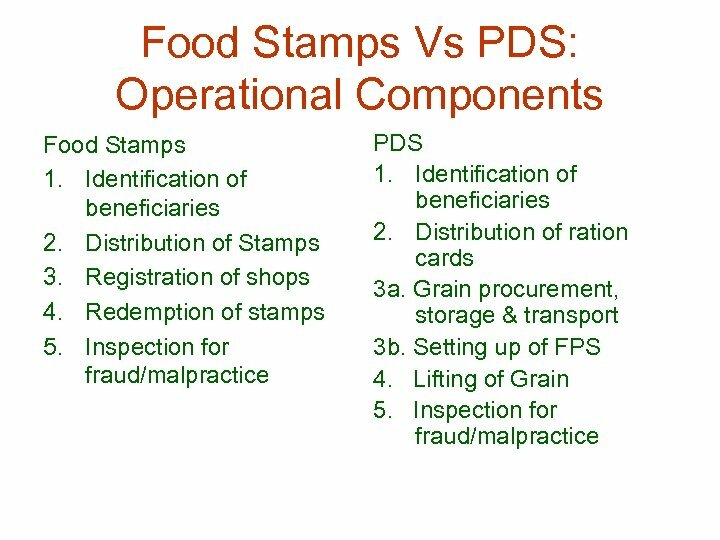 • Make marketing system viable • Food stamps can achieve the above more effectively than PDS. 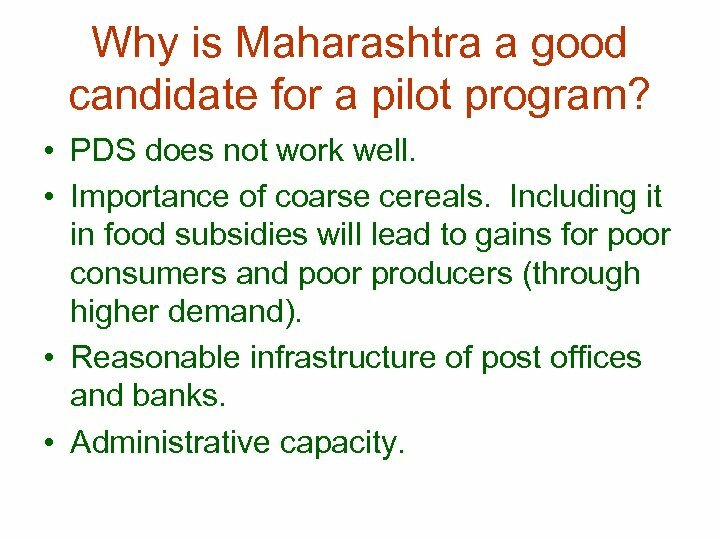 Why is Maharashtra a good candidate for a pilot program? • PDS does not work well. 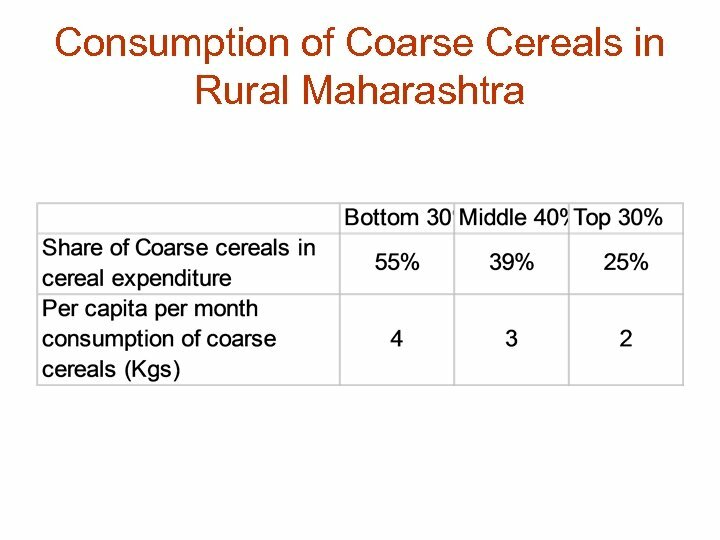 • Importance of coarse cereals. Including it in food subsidies will lead to gains for poor consumers and poor producers (through higher demand). • Reasonable infrastructure of post offices and banks. • Administrative capacity.